My best friend in the whole world is heart broken and there’s nothing I can do to help. I feel helpless as she, and so many others, click through countless articles, photos, and disaster relief websites online, watching her once-home turn into dust. We spoke on the phone yesterday and I cried. I cried because I imagined if my once-home, Paris, one day, turned into nothing. I cried because history once so beautiful, is now gone. And I mostly cried because I am sad – Taylor’s host family who supported her and cared for her for while she lived in Nepal for six months, are now struggling to find food, water, and shelter. They are safe – for now – but no one is out of the woods just yet. Maybe the worst is still to come, but I have hope that things will get better soon. This is the first natural disaster that has touched my heart in such a deep way, because I feel so sad for everyone who wants to do so much more, but feels so powerless. Sending money can’t cure the world’s problems, but it sure as hell can help a great deal. I am also lucky enough to have been connected to a beautiful artist, Nupoora, whose work I admire as she creates not only visual beauty, but works towards a greater goal. 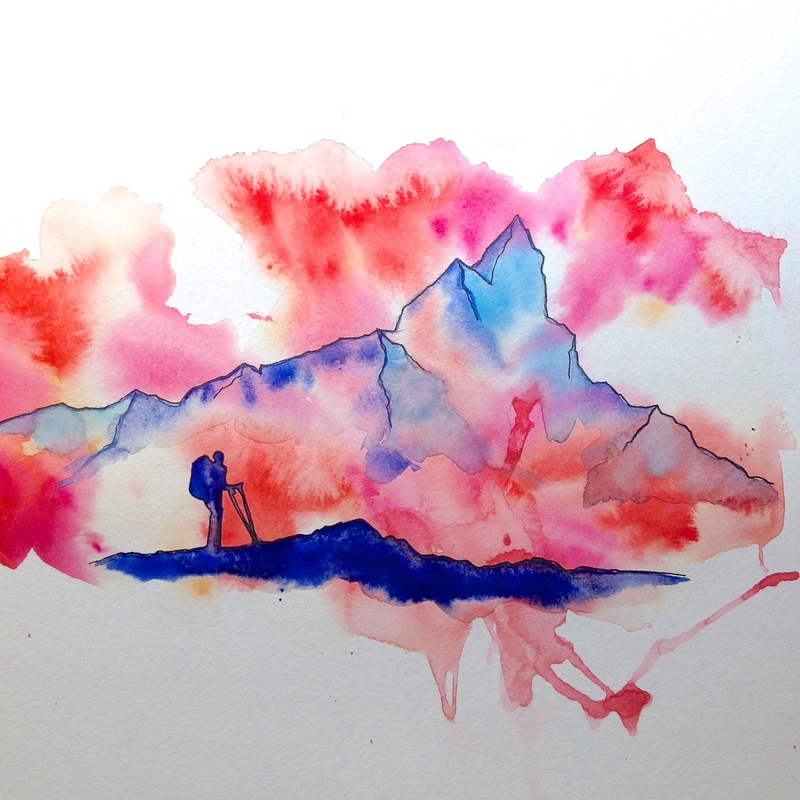 I love her new work to help disaster relief for Nepal and share the stunning landscapes of this country. Click here to visit her website and view more artwork. “We are backpackers, journalists, and photographers. We are soul searchers, adventurers, and culture bridgers. But today we are storytellers. Each of us has been welcomed into Nepalese homes where we shared meals, laughs and cries. We have trekked to base camps on the worlds highest mountains, been lost in the streets of Kathmandu, and been humbled by the welcoming culture that defines Nepal. We’ve walked the grounds now scattered with heaps of rubble, and shaken hands with climbers who have recently perished on Everest. We’ve heard the cries of mothers searching for lost children, and watched as cremation ceremonies line rivers of once thriving towns. Our mission is simple: to return the love shown to us by the people of Nepal. From Pokhara, we’ve followed and experienced the aftermath of the earthquake and its relentless aftershocks; many small villages nearby have been wiped away by landslides. While international relief efforts pour in, these remote places will be the last to receive aid due to their challenging location and the overwhelming need in Kathmandu. We have been fortunate to make local contacts in Pokhara, including the Vice President of the Nepal Red Cross Society, Mr. Dol Raj Pandey. ‘The greatest need right now in the districts of Gorkha and Kaski, is shelter,’ says Mr. Pandey. In the Kaski district alone, initial reports of 800 homes destroyed and 2000+ homes damaged means many families are now homeless. With the monsoon season beginning in one month, an onslaught of 110 days of continual rainfall will commence….